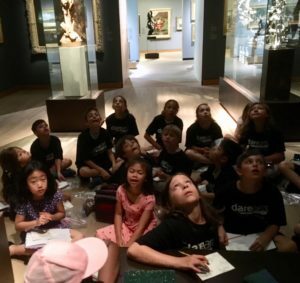 This July, École Nesbitt School invited DAREarts to partner in their summer school to help their young students in grades 1 to 5 improve their literacy and leadership skills. Located in inner-city Montreal, many of the students face socioeconomic challenges that limit their exposure to experiences beyond the school. 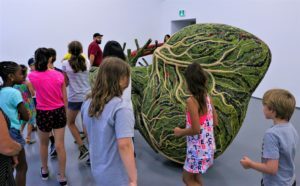 Led by DAREarts Quebec Coordinator & Lead Teacher, Deirdre Potash, the children created with author Clémence Dumas-Côté, musician Rob Lutes, the DHC/ART Contemporary Gallery and the Montréal Museum of Fine Arts. Nesbitt School principal Antoinette Scrocca and teachers Nancy Saltarelli and Julie Hervieux were there every step of the way with great leadership and enthusiasm. Each day brought new experiences that dared the students to be their best selves through Discipline, Action, Responsibility, and Excellence. The theme was simple yet profound: DARE to Dream. With Clémence Dumas-Côté, each child added to their own writer’s notebook, motivating them with innovative ways to practice their writing skills each day. With Rob Lutes, the children composed their own Blues song after learning about the history of slavery. On a special trip to the DHC/ART Contemporary Gallery, with guides Amanda and Daniel, the children toured the works of Bharti Kher, where one child exclaimed, “In the museum we can’t touch with our hands, but we can with our eyes.” The class created a special collage on an upcycled ceramic plate to reflect their museum experience. 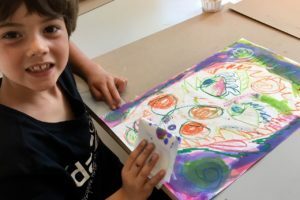 At the Montreal Museum of Fine Arts, the children were inspired by the artwork of Neo-Expressionist, Jean-Michel Basquiat and Cubist, Pablo Picasso, and created their own insightful self portraits. On their final DAREarts Showcase day, the class welcomed parents, family, and friends into the school’s gymnasium for a presentation of their new knowledge and creations, plus a celebration of their achievements as a team of young leaders. Several parents shared that, at first, they didn’t see the value of using the arts to improve academic and interpersonal skills in their children. But then they were amazed to see the students’ accomplishments! Many parents shared how they saw a huge difference in their children in just a short amount of time, and they were grateful that they were exposed to a wider world of museums, authors and musicians. DAREarts Quebec thanks all its supporters including National Supporter – Northbridge Insurance; Lead Supporters – Anne Livingston, Baton Rouge, Bank of America Merrill Lynch, Scotiabank, TD Bank Group; and Local Supporters Réseau Réussi Montréal, the McCarthy Tetrault Foundation, DHC/ART, Montréal Museum of Fine Arts, and Chapters.